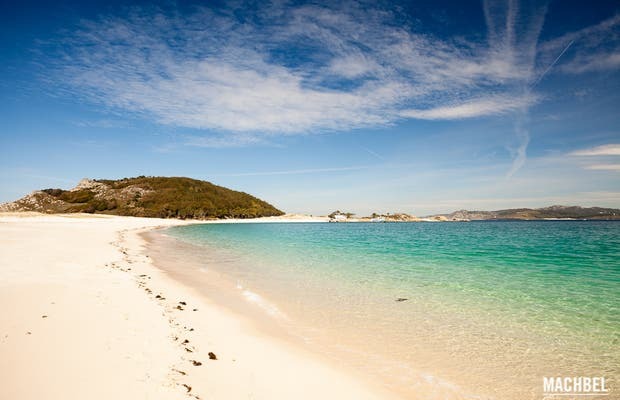 Last summer I went camping with some friends in Baiona (Galicia) and the Cies Islands, both places are spectacular! We spent the first four days in the camping in Baiona; it was quite complete, with a small supermarket and cafeteria, pool and clean bathrooms. In Baiona we visited the city Santa Tecla and went to Santiago one afternoon. I love Santiago, it is a capital full of life. The cathedral is beautiful, just like its square, which has millions of bars to drink a beer and eat something. Everyone seems to be on the streets, impressive! The area of the Rías Baixas has its own microclimate and our stay couldn’t have been better, we came back really tanned. The weather was great. By night we needed a light jacket. I’ve wanted to go there for a long time, and finally this year I was able to accomplish my dream. Months before, I booked my ticket on the internet with the shipping company Mardeons for the journey between Vigo and Cies Islands, since there are a limited number of places a day. The journey lasts about 45 minutes. When you get there you basically have all day to get lost on the island. I went in the summer and there were too many people, and everyone walked towards the lighthouse. Anyway, it was worth visiting this beautiful place. We took some sandwiches to eat there, although in the boat there is a bar where you can buy sandwiches, drinks, ice creams, etc.